The ketubba was enacted by Šimon b. Šatah (TB Šabbat 14b) in order that it might not be esteemed a light thing for a man to divorce his wife (Maimonides, Hilkoth Išuth 10:7). The enactment provides for a man's wife to receive a fixed sum of money, usually accruing from his property, in the event of his divorcing her or of his predeceasing her. R. Šim‘on b. Gamli’el, however, held the view that the ketubba was a teaching derived from the Law (TB Ketubbot 10a). Whatever its origins, the practice has spread itself since ancient times amongst all the communities of Israel, the law prescribing that the ketubba be drawn up before the night of the wedding, and read aloud during the ceremony. In Yemen, the custom was to read the ketubba before the actual betrothals took place, so that if the bridegroom wished to back down, he could still do so. The reading was performed by the mori (rabbi) who read the contract while standing. When the mori concluded its reading, he would roll it up and hand the ketubba to the bridegroom, at which time the bridegroom stood up and commenced to make the benedictions and the actual betrothals. As in most contracts made between two parties, there are mutual obligations, conditions and terms of reciprocity for such a contract to hold up as good. Thus said R. Yannai: The conditions written in a ketubba, [when breached], are tantamount to [forfeiture of] the ketubba (Ketubbot 54b). A woman who denied coitus unto her husband, a condition of the ketubba, was considered legal grounds for forfeiture of her marriage contract, with the principal and additional jointure being written off. (See translated text of ketubba for a broader understanding of these terms.) In former times, they would deduct seven denarii per week from the dower's price of her ketubba, for as long as she persisted in her state of rebellion against her husband by denying him to cohabit with her. The seven denarii were fixed in accordance with the number of unwritten obligations a woman was seen as having towards her husband: to grind, to bake, to cook, to launder, to breastfeed her son, to make-up his bed, and to spin wool (Berešit Rabba 52:13). A man, likewise, if he denied coitus unto his wife, was formerly compelled to add an additional three denarii per week unto the dower's price of her ketubba, until at last he acquiesced to his wife's desires. These three denarii were fixed in accordance with the three major responsibilities a man was seen as having towards his wife from the standpoint of the Law (Ex. 21:10): to provide food, to provide clothing and jewellery, and to cohabit with his wife (Berešit Rabba, ibid.). In Yemen, the financial obligations pledged by a man to his wife were never seen as fictitious, as they are often viewed today. Rather, all obligations were legally binding and enforced by the courts. If a man divorced his wife without due cause, the court would oblige him to pay his wife the monies pledged in her ketubba. However, in cases where the woman sued for a divorce, it was sometimes seen as a breach of contract, and the husband was not always compelled in such cases to pay her ketubba. One such case had arisen in San‘ā’ where the daughter of the Chief Rabbi and President of the Court, Yihye Yishāq Halevi (1905–1932) was married to Yihye b. Nissim Mansūra, and their marriage had fallen apart. The woman returned to live in her father's house, without receiving a divorce. Her father soon began to appeal to his fellow jurists to force the husband to dissolve their marriage by giving the estranged wife a bill of divorce, as also to make good all payments in her ketubba. The Rabbi's daughter claimed that she found her husband intolerable, or what is known in Hebrew as me’is ‛alay. The fellow jurists, R. Yihye Qafih and R. Yihye Abyad, contended that he ought, indeed, to divorce his wife, but not be compelled to pay her ketubba, citing that a woman was not to be believed when saying that her husband was intolerable, lest perhaps she laid eyes upon some other man. Now there arose a great dispute over this matter, dividing the community. Some said that he ought to divorce his wife and to pay her ketubba, while others said that he ought to divorce her, yet not pay her ketubba. At length, after much coercive speech and prodding, the husband divorced his wife, yet was she not entitled to any settlement. He eventually went off and was married to a different woman. The ketubba which we have selected is unique in that it bears the signature of one of the greatest Rabbis ever produced by Yemen, Viz., R. Yihye b. Yosef Sālih, known by the acronym Mahris. 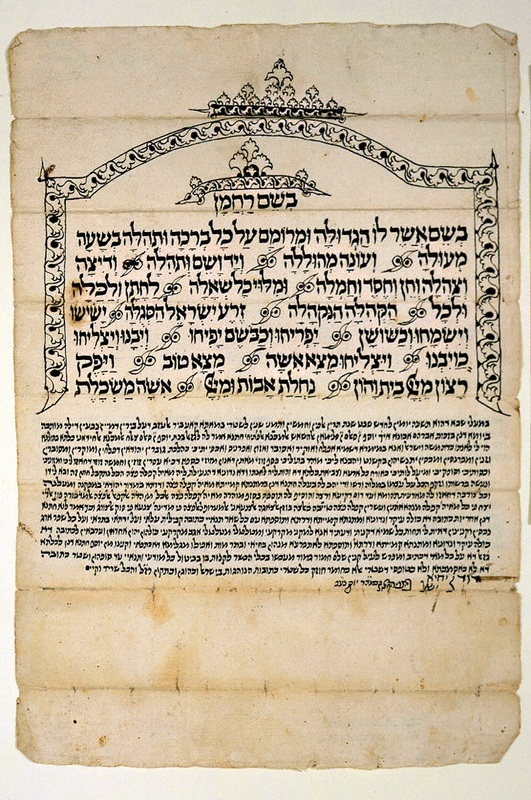 Today, it is found in the Ketubba collections at the library of the Jewish Theological Seminary of New York, written on paper and measuring 32.8 x 22.1 cm. The handwriting is believed to be that of Mahris. The year in which the ketubba was written was 1747 C.E. (corresponding with the year 2058 of the Seleucid Era, or what is also known as the year of Alexander, or the Era of Contracts), written in the city of San‘ā’, some sixty-seven years after the community's return from their Exile to Mawza‛. The old Jewish Quarter (al-Sā’ila) had been demised of its former status, while the new quarter had just been built without the walls of the old city. During that same year, the community would lose their respected and beloved Rabbi, David b. Yihye Hotּer, who served as President of the Court atSan‘ā’. So, too, the secretary of the Court, R. Yosef b. Sa‛adia Bešārī, a man responsible for making a written record of all deeds transacted in the Court, had ceased to work in this profession. בְּשֵׁם אֲשֶׁר לוֹ הַגְּדוּלָּה / וּמרוֹמָם עַל כָּל בְּרָכָה וּתהִלָּה / בְּשָׁעָה מְעוּלָּה וְעוֹנָה מְהוּלָּלָה / וְיָד וְשֵׁם וּתהִלָּה / וְדִיצָה וְצַהֲלָה / וְחֵן וְחֶסֶד וְחֶמלָה / וּמִלּוּי כָּל שְׁאָלָה / לֶחָתָן וְלַכַּלָּה / וּלכָל הַקְּהִלָּה הַנִּקהָלָה / זֶרַע יִשׂרָאֵל הַסְּגֻלָּה / יָשִׂישׂוּ וְיִשׂמָחוּ / וְכַשּׁוֹשָׁן יַפרִיחוּ / וְכַבֹּשֶׂם יָפִיחוּ / וְיִבָּנוּ וְיַצלִיחוּ / כְּוַיִּבנוּ וַיַּצלִיחוּ / מָצָא אִשָּׁה מָצָא טוֹב וַיָּפֶק רָצוֹן מֵיְיָ / בַּיִת וָהוֹן נַחֲלַת אָבוֹת וּמֵיְיָ אִשָּׁה מַשׂכָּלֶת. בְּמַעֲלֵי שַׁבָּא דְּהוּא תִּשׁעָה יוֹמִין לְחֹדֶשׁ שְׁבָט שְׁנַת תְּרֵין אַלפִין וְחַמשִׁין וְתַמנֵי שְׁנִין לִשׁטַרֵי בְּמַאתָּא קַאע בִּיר אַלעֲזַבּ דְּעַל בֵּירִין דְּמַיִין נָבעִין דִּילַהּ מוֹתְבַהּ בְּיוֹמָא דְּנָן בִּזכוּת אַברָהָם אֲבוּנָא אֵיך יוֹסֵף ןׂ סַאלִם ןׂ סְלַימַאן אלהשׁאשׁ אלמְכֻנָּא אלפְתַיחִי חַתנָא אֲמַר לַהּ לגַזאל בִּנתּ יוסף ןׂ סַאלִם צַאלִח הַמְּכֻנָּא אלחַידַּאנִי כַּלְּתָא בְּתוּלְתָא הֲוִי לִי לְאִנתּוּ כְּדָת מֹשֶׁה וְיִשׂרָאֵל וַאֲנָא בְּמֵימְרָא דִּשׁמַיָּא אֶפלַח וְאוֹקֵיר וַאֲסוֹבַר וַאֲזוּן וַאֲפַרנֵיס וַאֲכַסֵּי יָתִיכִי כְּהִלכַּת גּוּברִין יְהוּדָאִין דְּפָלְחִין וּמוֹקְרִין וּמסוֹבְרִין וְזָנִין וּמפַרנְסִין וּמכַסִּין יָת נְשֵׁיהוֹן בִּקשׁוֹט וִיהֵבנָא לִיכִי מוֹהַר בְּתוּלִיכִי כֶּסֶף זוּזֵי מָאתַן דְּאִנּוּן מִזּוּזֵי כַּספָּא דָּכיָא עַסרִין זוּזִין וְחַמשָׁה זוּזֵי דְּחַאזוּ לִיכִי וּמזוֹנִיכִי וּכסוּתִיכִי וְסוּפקִיכִי וּמֵיעַל לְוָתִיכִי כְּאוֹרַח כָּל אַרעָא וּצבִיאַת כַּלְּתָא דָּא וַהֲוָת לֵיהּ לְאִנתּוּ וְדָא נְדּוּניָא דְּהַנעֵילַת לֵיהּ מִאיַה' קַפלֵה פֻצַׂה הַכֹּל נִתקַבַּל חָתָן זֶה וּבָא לְיָדוֹ וְנַעֲשָׂה בִּרשׁוּתוֹ וְזָקַף הַכֹּל עַל עַצמוֹ בְּמִלוָה וּרשׁוּ וְדִי יָהֵב לַהּ בַּעלַהּ חַתנָא דְּנָן בְּמַתַּנתָּא קַמַּייתָּא מִאיַה' קַפלֵה פֻצַׂה וְדָרתָא בִּמדוֹר יְהוּדָאֵי בְּמַפְּקָנַהּ וּמַעֲלָנַה וְכָל צוּרכָּהּ דְּחַאזוּ לַהּ מֵאַרעִית תְּהוֹמָא וְעַד רוּם רְקִיעָא וְרָצָה וְהוֹסִיף לָהּ תּוֹסֶפֶת בְּסוֹף מוּהרָהּ מִאיַה' קַפלֵה פֻצַׂה אַלכֻּל מִן הַדֵׂה אלקִפַאל אלפֻצַׂה אלמַדׂכּוּרַה פַוק אלַּדִׂי יַצִח פִי כֻּל מִאיַה' קַפלֵה מִנְּהַא אתׂנַין וְעִשׁרִין קַפלֵה פֻצַׂה טַיְּיבַּה כׂאלִצַה בִּוַזן אלצאגַה אלצַנעאנִי אלמַערוּף לִאלפֻצׂה פִי מְדִינַה' צַנעַא פִי סוּק אלצֻוַוג וְכָּך אֲמַר לַנָא חַתנָא דְּנָן אַחרָיוּת כְּתוּבָּה דָא כּוּלָּהּ עִיקָר וּנדּוּניָא וּמַתַּנתָּא קַמַּייתָּא וְדָרתָא וְתוֹסֶפתָּא עִם כָּל שְׁאָר תְּנַאיֵי כְּתוּבָּה קַבֵּילִית עֲלַאי וְעַל יָרְתאי בָּתרָאי וְעַל כָּל שְׁפַר אֲרַג נִכסִין וְקִניָינִין דְּאִית לִי תְּחוֹת כָּל שְׁמַיָּא דִּקנֵיתִי וְדַעֲתִיד אֲנָא לְמִקנֵי מְקַרקְעֵי וּמִטַּלטְלֵי מִטַּלטְלֵי אַגַּב מְקַרקְעֵי כּוּלְּהוֹן יְהוֹן אַחרָאִין וְעַרבָּאִין לִכתוּבָּה דָא כּוּלָּהּ עִיקָר וּנדּוּניָא וּמַתַּנתָּא קַמַּייתָּא וְדָרתָא וְתוֹסֶפתָּא לְאִתפְּרָעָא מִנְּהוֹן בְּחַיַּאי וּבָתַר מָוֶת וְאַפִילּוּ מִגְּלִימָא דְּאַכִּתפַאי וְקָנִינוּ מִן יוֹסֵף חַתנָא דְּנָן לכַלְּתָא גַזאל דָּא עַל כָּל מַאי דְּכַתִיב וּמפָרַשׁ לְעֵיל קִניָן שָׁלֵם חָמוּר גָּמוּר מֵעַכשָׁו בִּכְלִי הַכָּשֵׁר לִקנוֹת בּוֹ בְּבִיטּוּל כָּל מוּדַעֵי וּתנַאיֵי עַד סוֹפְהוֹן וּשׁטָר כְּתוּבָּה דָּא לָא כְּאַסמַכתָּא וְלָא כְּטוּפסֵי דִּשׁטַרֵי אֵלָא כְּחוֹמֶר חוֹזֶק כָּל שִׁטרֵי כְּתוּבּוֹת הַנּוֹהֲגוֹת בְּיִשׂרָאֵל וְכַהוֹגֶן וּכתִקּוּן רִזִ"לִ וְהַכֹּל שְׁרִיר וְקַיָּים. [We bear witness] this day, on the Sabbath eve (Friday), corresponding to the ninth day of the month of Ševat, [in] the year two-thousand and fifty-eight of the Year of Alexander, in the town wherein lies the quarter known as 'The Single's Well' (Bīr al-'Azab), [a city] situate upon her wells of flowing water, by the merit of Abraham our forefather, how that Yosef, the son of Sālim, the son of Slaymān al-Hišāš, who is called [also] by the name al-Ftayhī, being the bridegroom, said to the virgin bride, Ghazāl, the daughter of Yosef, the son of Sālīm Sālih, who is called [also] by the name al-Haydānī, being the virgin bride, "Be my wife, in keeping with the religion of Moses and Israel, and I shall, with God's help, work, and honour, and sustain, and nourish, and support, and invest you with clothing, according to the manner of Jewish men who work, and honour, and sustain, and nourish, and support, and clothe their wives in good faith, for which I have proffered you the dower's price of your virginity, two-hundred silver denarius, in which [sum] there are twenty-five denarius of pure silver coin in specie [of that kind which was formerly used in the Holy Šeqel], of which things you are most worthy, as also your sustenance, and your apparel, and your conjugal rights, that I might come upon you according to the way of the whole world." Now this bride consented [to such matters], and she has become untohimawife. Now this largess (dowry) which she brought into him [upon wedlock] is valued at one-hundred silver-[alloyed] qaflas. Allhasbeen received by this bridegroom, and has come intohishand,andhasbecomehispossession,andhehasincurred every-thing upon himself as it were a loan [given unto him], and a debt. That which the husband, the said bridegroom, has vouchsafed unto herasan initial gift is valued at one-hundred silver-[alloyed] qaflas, and a courtyard (dwelling place) amongst those places inhabited by Jews, allowingherto go out and to come him, and supplying her with all that which she might stand in need of, which are but fitting unto her, from the depths of the earth [below] unto the height of heaven [above]. And he has desired, moreover, to confer upon her an additional jointure subsequent to that which is prescribed of the dower's price, the value of which [jointure] is one-hundred silver-[alloyed] qaflas. Allarecomprised of those silver-[alloyed] qaflas mentioned above, which in every one-hundred qaflas of those calculated are twenty-two pure and unalloyed silver qaflas, based after the weight of the San‘ānī, jewelers, and which same [standard] is recognized as silver in the city of San‘ā’, in the Silversmiths' Marketplace. The Younger, Yihye the son of our honourable teacher, the Rabbi, Yosef, whose inheritance is in the Garden of Eden. Yehudah Nini (editor), al-Misawwadeh: Court ledger of San‘ā’'s Jewish community in the 18th century; Hebrew Translation by Nissim Benyamin Gamli’eli. Tel-Aviv 2001. Yosef Qāfih, Halikhot Teiman. Jerusalem 1961. Amram Qorah, Sa‘arat Teiman. Jerusalem 1954. Yosef Tobi, Anecdotes on the Jews of Yemen from Responsa. A Tribe and Nation, VII (1973), pp. 271-291. Shimon Tzalach (Sālih) – editor, Tiklal ‘Es Hayyim Hashalem. Jerusalem 1971. Shemu’el Yavne’eli, Masa‘ Teiman. Tel-Aviv 1952. According to Numbers Rabba 9:8, as well as Mishnah Ketubbot 7:6, whenever a married woman goes out publicly with her head uncovered, it is an act tantamount to exposing herself in public while naked, or what the Torah calls "ervah" (Heb. ערוה), and such an act would constitute grounds for a divorce without a settlement, as it is written: "…for he found in her a thing of nakedness" – (Heb. כי מצא בה ערות דבר) – Deut. 24:1. So was I told by the late Rabbi Yosef Qāfih, of blessed memory. Still, it was often that the woman would voluntarily waiver her rights to payment in order that her husband becomes willing to give her a divorce. In such cases, a court document was drawn up to that effect. For examples of this, see: Yehudah Nini (editor), al-Misawwadeh: Court ledger of San‘ā’'s Jewish community in the 18th century; Hebrew Translation by Nissim Benyamin Gamli’eli. Tel-Aviv 2001. On the use of this term in Yemenite tradition, see: Yosef Tobi, Anecdotes on the Jews of Yemen from Responsa. A Tribe and Nation, VII (1973), pp. 271-291. The above episode was relayed to me by R. Šalom b. Slaymān Cohen, born in San‘ā’ 1912. The Questions & Responsa have been printed by Yavne’eli, Masa‘ le'Teiman 1952, pp. 187‒188; 196‒199. For the specific reference mentioned above, see pg. 198, item # 12. See Qorah 1954, p. 15. According to the Talmud (Qiddušin 11b), as also explained by Maimonides (Hilkoth Išuth 10:8), the denarius mentioned here are coins having each the silver content of 1/8 that of the Holy Šeqel. Mahris writes in his Tiklāl ‘Es Hayyim, vol. I, p. 291b (the Redemption of the Firstborn), that the Holy Šeqel had, after the 20 % surcharge for redeeming one's son, the silver content of 20.16 grammes. This puts the weight of the Holy Šeqel at the time of Moses at only 16.128 grammes. This would mean that each denarius had the silver content of only 2.016 grammes. Maimonides adds that in addition to silver, these coins also had a copper alloy which amounted to seven times more than the volume made-up by the silver. The total aggregate of silver in two-hundred denarius amounts to 403.2 grammes, or what is the equivalent of twenty-five Holy Šeqels. (The silver content found in thirty-two U.S. Kennedy half-dollars of the 1964 mint, along with a little more than one-fourth of yet another U.S. Kennedy half-dollar, are the equivalent of the same. Each U.S. Kennedy half dollar of that mint weighs 12.5 grammes, and is of pure, unalloyed silver.) Needless to say, formerly, the purchasing power of this sum of money was greater than what it is today. The Hebrew word used here is nedunya, or what is sometimes translated as 'the bride's outfit.' The word is more correctly translated as 'largess,' or 'dowry,' since it is traditionally bestowed upon a man's daughter by her father before she marries, and she brings the same money and items into the marriage (whether it be money, jewellery or household effects), and which, if her husband takes responsibility over them, are deemed as merely a loan unto him, which he is able to freely make use of while married to her, but must return them unto her father in the event of his wife's early death. If the woman's father were a liberal man, he would not demand the return of such items. See: Maimonides, Hilkoth Išuth 16:1. In San‘ā’ the custom was to write a fixed sum of one-hundred silver-[alloyed] qaflas in the ketubba of all virgins as the value of the nedunya (dowry). In the case of all widows or divorced women, the fixed sum was fifty silver-[alloyed] qaflas. The qafla was a weight equivalent to about 3.2 grammes. Mahris writes in ‘Es Hayyim (the Ketubba Version) that in the days of R. Yihye al-Bašīrī they made an enactment in the city of San‘ā’, that all financial obligations pledged by the husband to his wife should be written out in the local currency of those days. For example, for every 'one-hundred qaflas' of that ancient coin, there was actually only twenty-two qaflas of a pure and unalloyed silver content, while the rest was copper. This means that one-hundred qaflas was equal to 70.4 grammes of silver, excluding the copper content. In San‘ā’, this, too, was a fixed sum, written in the ketubba of every virgin. Widows and divorced women were given a fixed sum of half this price. Meaning, the exit way from her house, as also the entranceway, should be facing the road or main street that is used by the Jews (‘Es Hayyim). By this is understood that the husband is obligated to provide his wife with household effects, such as a well, a millstone, toilet facilities, etc. It also implies providing her with a decent burial, and all other obsequies (‘Es Hayyim). The Hebrew word employed here is tosefeth, or what is translated by some as 'the increment.' This, too, was a fixed sum subscribed by all grooms in San‘ā’ and given to their espoused virgins, along with the principal (or dower's price), in the event of their divorcing their wives, or in the event of death. This sum was traditionally made out to be half of that of the principal. For example, if a virgin's ketubba was valued at 200 zuz, the increment was made out at one-hundred. If a widow's ketubba was valued at 100 zuz, the increment was made out at fifty. The custom in Yemen was not to consolidate these different financial obligations, or pledges, into one single, aggregate sum as is practised by some communities. Rather, all financial obligations were written out as individual components, and had the same fixed sums for all persons. The Hebrew word used here is ‘iqar, or what is known as the 'principal liability' (i.e., two-hundred zuz or dinarius if he had married a virgin, or one-hundred if he had married a widow), to be paid unto the bride from her husband's property, in the event of her husbands' death, or of her being divorced by her husband. The Act of Purchase, or what is also called 'the cancellation of any statement' (bittul muda‘a), is a ceremony that was also practised in divorces. This co-signature on the Marriage Contract is believed to be that of R. David b. Yihye Hoter who served as President of the Court at San‛ā’ until the very year in which this deed was written. The reference here is to Mahris (R. Yihye b. Yosef Sālih), b. circa 1713, d. 1805 C.E., and who later became one of the most outspoken Rabbis of Yemen, producing more than eight momentous works, and whose rigorous support for the continuance of Yemenite Jewish customs and traditions amid change gave him the unrivaled position of being Yemen's one and all-time-great exponent on Jewish law.